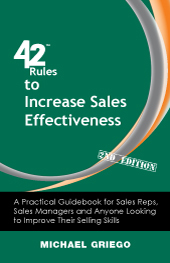 42 Rules to Increase Sales Effectiveness provides the keys to sales excellence in today�s challenging world. When one approaches sales with a healthy and balanced sense of self and care for others, then this rule that �it�s not about you� is easy to swallow. An effective salesperson carries him or her self with strength, confidence and competence. There�s nothing like a highly effective and productive salesperson with a heart and sensitivity to others. It stands out and customers appreciate it. Even if they can�t put there finger on it. Michael Griego is president and founder of MXL Partners, a sales consulting firm providing sales training and management services. Michael has over 28 years of high-technology sales and management experience at companies ranging from IBM, XL/Datacomp-StorageTek, Dataquest/Gartner Group, Zona/Intelliquest, Active Decisions and Workshare. A popular sales trainer for companies worldwide and instructor/lecturer and keynote speaker at CEO summits and leading business schools, Michael has been an advisor and consultant for numerous organizations and trained hundreds of teams and salespeople. He has a BA degree from Occidental College and an MBA from Stanford University. If you are a professional salesperson, sales manager or director, VP of sales, CEO, any role in marketing, or anyone supporting selling efforts, this book is for you. It will teach you updated tools, language and tactics of selling in today's market. Michael Griego, a professional sales consultant and trainer to Fortune 500 firms and leading Silicon Valley technology firms, has reduced the keys to sales effectiveness to 42 rules. These rules have been road tested over 28 years of personal sales and management experience and close observation of many salespeople and sales organizations. These rules apply to all selling efforts, from high-tech enterprise sales to non-technology sales. Sales isn't rocket science, but it's not ABC simple either. While selling is often either over-engineered or over-simplified, today even the professionals are caught off-guard in a changing world and marketplace. "Old school" is out; new school is in, but with a twist. There are key sales fundamentals that never go out of style but still need a refresh. 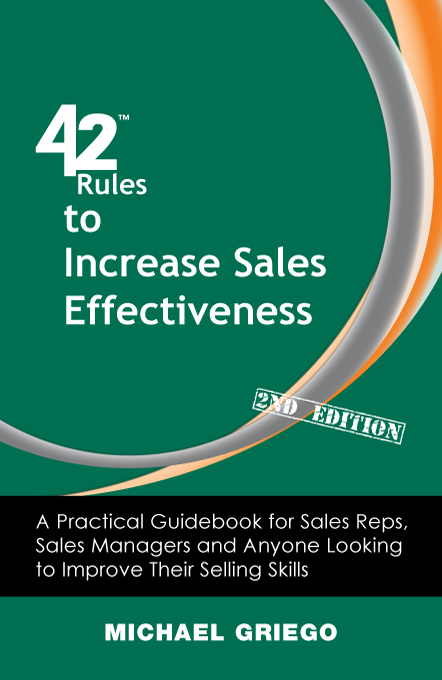 This book, 42 Rules to Increase Sales Effectiveness (2nd Edition), upgrades and adjusts foundational rules for today's business environment to increase the overall sales effectiveness of individuals or teams. This book will challenge standard conventions while reinforcing best practices that have gotten lost in the recent advancement of new technologies and modern tools. It's a great read for any professional to confirm that their own "salesmanship" is still on target and appropriately current. Use this as your own handbook to reset on key best-practices for the new day or teach a new generation 42 nuggets and practical applications of this fascinating activity called Sales. Want a branded edition of 42 Rules to Increase Sales Effectiveness (2nd Edition)? "Mike simplifies the complex process of winning and keeping customers and his anecdotes help personalize the advice. This book is a must read for anyone involved with sales." "Mike is a top sales expert and trainer who trained our sales team with great results. I highly recommend this book to anyone who needs to sell." "Griego's 42 Rules are contemporary, practical and really work. Implementation in our company resulted in improved results and more successful sales professionals. Mike is one of the best salesmen, coaches, consultants and trainer in the business." "Mike is a sales mensch. His book has numerous practical quick tips and tools for sales and management." "Mike Griego has helped me focus on key areas of selling especially in tough economic environments. As a result of these sales tools, I have fine tuned my sales skills and completed one of my best quarters, earning recognition as the #1 rep out of 300 in the U.S."